Week 30 was certainly unusual with tropical cyclone Fantala (the most powerful cyclone ever recorded in the Indian Ocean) less than 300km to the south, which sadly decimated Farquhar Atoll. The seas around Alphonse became extremely rough and the rain at times unbearable. Fortunately, the full complement of guests all saw the brighter side and remained upbeat throughout the week. With the wind sticking around 30 knots everyone was restricted to fishing in the lea of Alphonse Island for three days, but they all still managed to make the most of it. Murray Collins and Tim Hammond snuck out for a short session on St Francois and managed to fool a few triggerfish to eat an Alflexo crab. Tim ended with a beautiful moustache and Murray with two gorgeous big yellowmargins. Vicki Mitchell did the ladies proud by also getting her hands on a beautiful moustache. This week the GT’s were around to with a total of eight fish for the week. Jim Hook was definitely our GT champion finishing his week off with three fish the largest being 75cm. Buck and Molly Ryan also helped with this tally by each getting a fish of 75cm in the surf. Ronnie Hoffman also made his mark with a fin perfect fish of 70cm. whilst David Agnew got a gorgeous fish of 60cm. 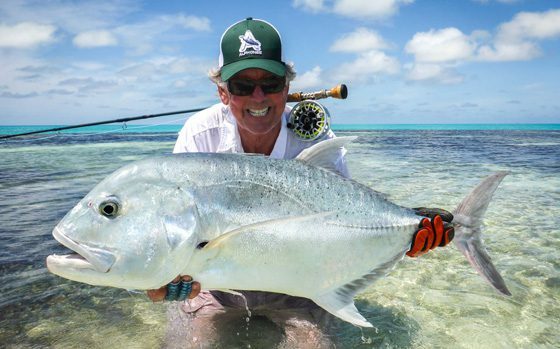 The Biggest GT of the week went to Bill Mitchell with a fish stretching the tape to 100cm on the button, an impressive and beautiful fish on the white sand. Another impressive and incredible, yet petrifying experience was Buck Ryan’s Indo-Pacific permit. Getting these fish to eat is often a challenge all on its own, but what often doesn’t get spoken about is how strong and fast these fish actually are. Their big forked tails and broad bodies make them by no means a push over. Yet another fish added to this record-breaking season’s tally. Tight lines from Keith and the Alphonse Fishing Co. team.